I’m not particularly good at shuffling cards and one day Heinze had been looking around on youtube for some card shuffling techniques and came across the Riffle Shuffle! It looked amazing! I tried it with a cheap set of playing cards we had laying around and I can tell you that the cards are not very pleased. And whenever I try it, the cards also tend to fly around the room. For now I’ll just stick to shuffling by making several face down piles of cards on the table and combining them again to one stack. Shuffling sleeved cards is even more interesting and extremely hard when your card sleeves are brand new and very slippery! What’s your favorite way to shuffle cards? Try it with plastic (poker)cards, a world of difference. The riffle shuffle and bridge riffle shuffle as more pleasing looking and sounding ways of shuffling. In my experience sleeved cards can simply be cut and then shoved into each other without much trouble. This cutting and shoving can be repeated multiple times for added effect. If I feel cards to too clumped up, I’ll start with a pile shuffle (so dividing the cards into separate stacks) and then doing the above process. Since pile shuffling doesn’t actually randomize the order of cards. I know riffle shuffling is popular in Magic tournaments for the specific purpose of wrecking the other guy’s sleeves. When I have the time and space, https://www.youtube.com/watch?v=PbqPkStUUS4 this is the best way to get it really random, but I usually try 7 riffles and go. One of the two most annoying things when playing with people. Keep up the comics, enjoying them ever since I discovered your comic. For cards in sleeves, a mash shuffle, done gently 7 times leads to a reasonable level of randomness with minimal damage to the sleeves. Spot all the Netrunner players, with the good shuffling advice!! ? Bwaha. Good to see you! Now if only there was a good way to shuffle the Hecatomb cards I just got…. Wow! Hecatomb! Now that’s a callback. Chupacabras for everyone! Lol! Yeah, I have a bad habit of discovering and getting obsessed with games only after they are well and truly dead. If cards realy need a shuffel ill put them in diftent stacks (card 1 in stack 1, 2 in 2 3 in 3 but for in stack 1 and repete.) obe of the best ways to suffek new decks. After tiS ill give them the normal shuffel. The bending/pharao shuffel is a pain ts see or hear for a gamer who is proud of his collection. you can learn to rifle/bridge shuffle from the side (so the cards are vertical in your hands) – less wear on the cards and possible to do with sleeves on without the cards getting caught inside each other. That’s my preferred method, or if I know the person whose game it is has a deep sense of care for their cards, Mash shuffle. But generally, it really doesn’t hurt the cards very much at all once you are very practiced. With sleeves from the side its even less. This is called the Hindu shuffle, and mathematically you’d need about a million of them to get a full randomization. Actually, around 2,500, not 1,000,000. Of course, that is opposed to the seven recommended in a riffle or mash. Riffle shuffling is actually not hard on the cards – once you’ve learned how to do it properly. And that’s the key. Someone new to riffle shuffling generally leaves the cards in horrible shape. 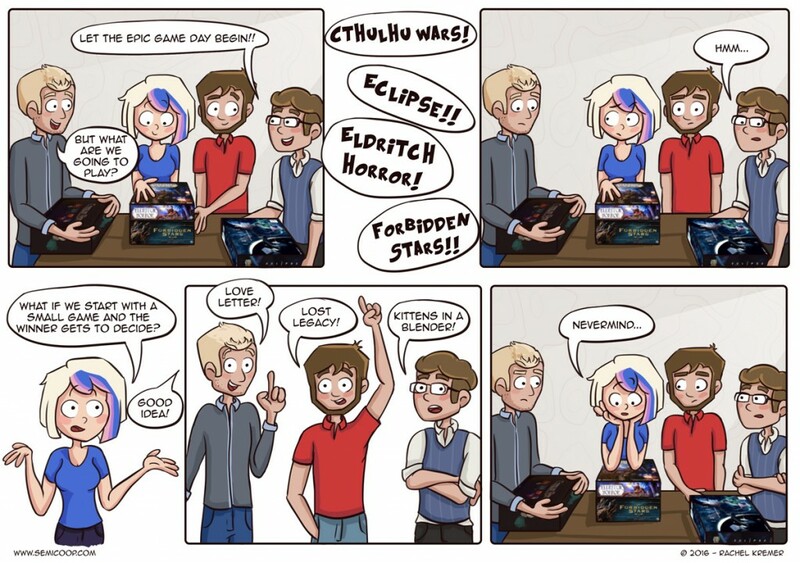 This is probably why most gamers as a whole hate riffle shuffling, and have the same level of horror as seen in the fourth panel of the comic. I’ve been riffle shuffling since I was in elementary school, which, coupled with stage magic lessons, means that I don’t beat the heck out of my cards. My first set of Netrunner was played solely with riffle shuffles for quite a long time before I got serious, and they’re still in perfect shape. Of course, I always shuffled for my wife (my primary partner), so didn’t have to worry how other people would handle them.